7 Mar: Mr and Mrs Yezdi with Jin and Robyn, after satsang in the Vishalakshi Mantap in ashram. 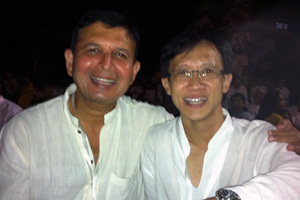 It was good meeting Mr Yezdi again since we first knew each other in Bali last April. 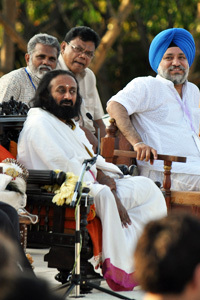 I'd told him then about our Seva 2011 intention and asked if we could do seva with Art of Living. He'd referred us to the Tribal School Project directed by Mr Chawal and it led us to begin our seva journey here in Bangalore Ashram. 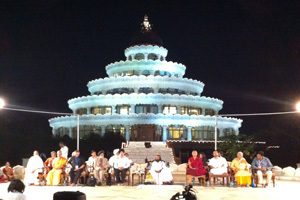 We have him to thank for the opportunity to work, learn and grow with Guruji and Art of Living. Bangalore was very hot in the day but cool at night. Robyn came down with a fever on the 2nd day and it lasted for 3 days. Thankfully we had Magnolia herbal essential oil from avita, and she recovered quickly. 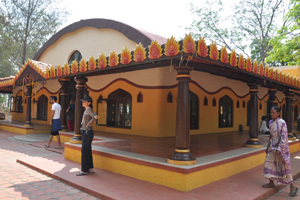 Living in the ashram meant vegetarian meals everyday. Food is mainly boiled to preserve their goodness. Rice and chapatti are served during meal times. It's quite delicious for Jin and I. For Robyn, it was 2 long weeks of 'acclimatization'! 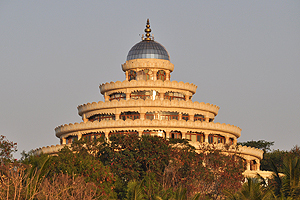 Vishalakshi Mantap, the main meditation hall, is the majestic landmark of the ashram. 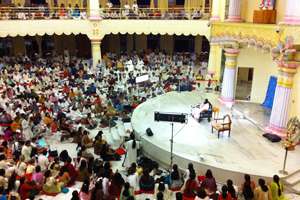 Every evening, satsang is held there and the crowd increases to thousands whenever Guruji is in the ashram. 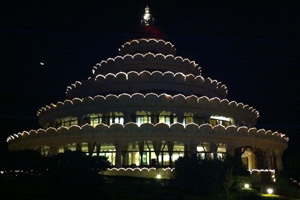 We were fortunate to arrive in the week when Guruji was present and enjoyed many evenings of his presence and sharing of wisdom. 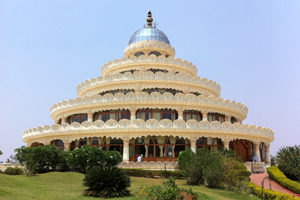 Sri Sri Ravi Shankar is the spiritual founder of The Art of Living Foundation and a Guru of joy, peace and love. 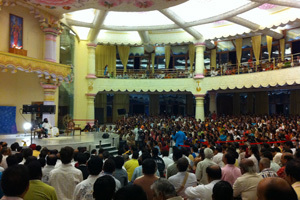 Thousands gather every evening for satsang and to hear Guruji's words of wisdom at the ashram. We met Guruji in person on the evening of 13 Mar 2011 to obtain his blessing for our seva with the Divine Karnataka Project and Tribal School Project in Jharkhand. 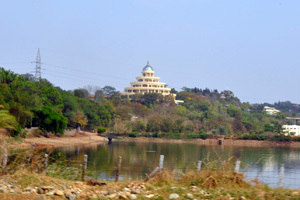 The ashram is a huge campus with many related organizations in nearby vicinity, like the Sri Sri Ayurveda Factory, children's schools, etc. We learnt that the kitchen prepares meals to feed 4000 on a normal day. During festive season, the number swells to 25,000! 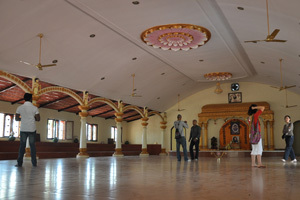 Old meditation hall used during the early days. Nowadays, it is used for wedding ceremonies. Sumeru Mantap: this is the stone bench on which Guruji sat and shared his wisdom with his followers in the early days. The old quarter is a such charming place, especially during sunset time. 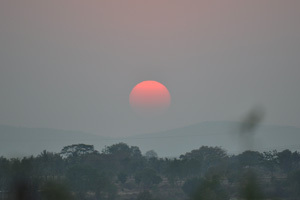 The Sumeru Mantap is a great place to enjoy the sunset. 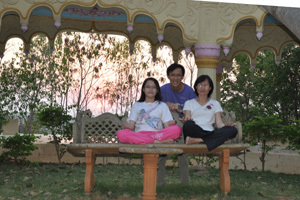 As the sun disappears under the distant hills, we meditated through the peace and tranquil. 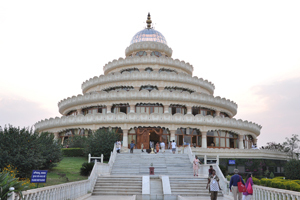 In the background of Robyn is the Vishalakshi Mantap, from where the melodious singing of the evening satsang could be heard faintly. < The Nandi accommodation block was our home for 2 weeks. It's a simple 3-bed room with fan and close to the VM. 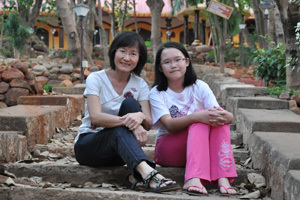 > Indrani is one of the 2 pet elephants in the ashram. It was wonderful to meet friends from Singapore during our stay there: Umesh, Shivi, Alka and hubby. 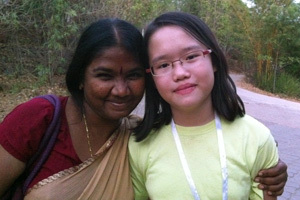 Lakshmi from the VVKI office took special care of Robyn, whom she fondly calls 'Sweetie Pie'. 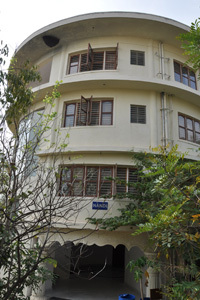 On 8 Mar, we travelled to the Vyakti Vikas Kendra India (VVKI) office in Bangalore city to meet with Mr Yezdi, Chairman of VVKI, to seek his guidance on what seva we could do with Art of Living while we were here in Bangalore. He asked a number of his staff/volunteers to brief us on their projects. 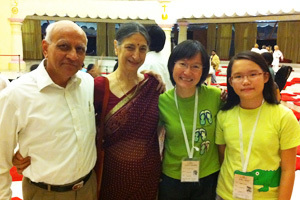 We met Tithi Pathik and her father, Mr Pathik, who are both working on the Divine Karnataka Project. We also met Ragini and Lakshmi. Mr Yezdi also arranged for me to meet with Ramesh Raman, CEO of the APEX Program, on 11 Mar. We soon discovered a role we could play in the Divine Karnataka Project. This is a volunteer-led initiative to socially transform the under-privileged people in thousands of slum and rural communities across the Karnataka state (of which Bangalore is in). It is a project of enormous scale and scope involving kids education, youth vocational skill training, woman empowerment, prisoner reformation, spiritual training for rickshaw drivers, etc. What is truly impressive is that this project has been primarily powered by volunteers since its inception in July 2009. Mr Pathik's intention is to approach the corporate sector for donation in the next phase of development. 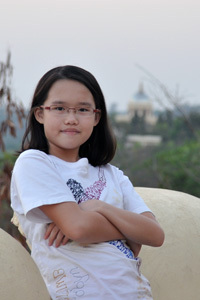 However, most of the volunteers and staff tend to be overly operation-oriented in the field and not marketing people. We seem to fit quite usefully in at this point given our experience in Corporate Social Responsibility and competence in corporate marketing and branding. Therefore, we decided to help DKP to develop a corporate fund raising campaign strategy and a set of marketing collaterals. We would be taken to the field to get a grasp of the various social transformation initiatives over the next 2 weeks and complete our work by end Mar or early Apr before moving northward to work in the Tribal School Project in Jharkhand with Mr Chawal.